Detached Cottage in a Sought After Area and Neutrally Decorated Throughout. Large Open Plan Living Area Comprising a Lounge, Snug and Dining Area. Country Style Kitchen with both Woodblock and Granite Work surfaces. 3 Double Bedrooms and Modern Family Bathroom. Superb Front Garden Extending to approximately 160ft with Views to the Sea. Gravelled Hardstanding Providing Plenty of Off Road Parking. Detached Double Garage with Vegetable Patches to Either Side. Offered with the Benefit of Having No Onward Chain. Leaving Douglas via the Promenade and continue out onto King Edward Road. Continue along the Coast Road through Groudle and continuing through Baldrine. Upon the approach to Laxey turn left into Ballacollister Road. 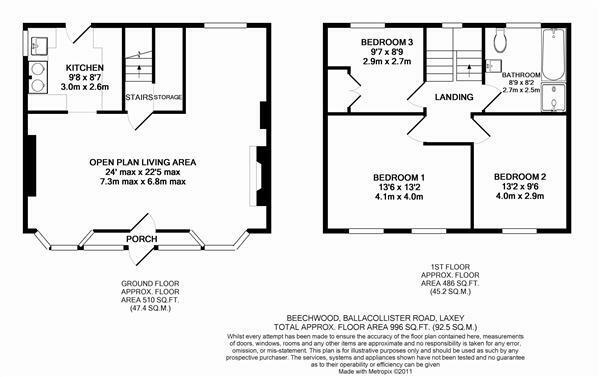 The property 'Beechwood' will be found situated on the left hand side clearly identified by our 'For Sale' board. A paved and gravelled path leads to the 3/4 glazed timber frame entrance door which opens to the built out porch. Timber framed windows to the front. Quarry tiled floor with an inset decorative feature square. Tongue and groove ceiling. Half glazed, stripped and waxed pine door opens into the open plan living area. The spacious L-shaped room is set into three areas. The dining area is to one side with the timber framed sliding sash bay window providing pleasant views over the cottage style garden to distant sea views. The Lounge also has a sliding sash timber frame bay window once again with a lovely outlook over the garden and to partial sea views. The large open grate fireplace has a slate hearth and Manx Stone background plus an inset cast iron multi fuel burner. Two television points and one telephone point. A large opening to the sitting area with a uPVC window to the rear elevation. Quality, wide solid oak wood floorboards run throughout this area. Door to the stairs. Well presented and fitted with cream shaker style base and drawer units. To one side, solid wood worksurfaces are fitted whilst to the other are granite worksurfaces with an inset ceramic 'Belfast' style sink with mixer tap. A 'Rayburn' cooker which also serves the water and heating. Integrated appliances include a fridge and washing machine. The solid oak floorboards continue through from the living area. Recessed lights. A uPVC window to the side elevation. Three quarter glazed timber frame door leads to the rear garden. A door opens from the living area to the stairs leading to the first floor, with a large storage area beneath. Stairs continue to the first floor. Double glazed uPVC window to the rear elevation. Exposed and waxed wooden floorboards. Access to the primarily boarded loft. A spacious double room with dual uPVC windows to the front elevation, fitted with bespoke wooden shutters and offering partial sea views. Exposed and waxed wooden floorboards. Television and telephone points. A good sized double room once again with partial sea views from the front aspect uPVC window. Fitted with a modern white suite comprising a push button flush WC, pedestal wash hand basin, panelled bath, a fully tiled enclosure with glass screen and a 'Mira' shower installed. The uPVC window has a pleasant wooded outlook. Tongue and groove panelling to the walls. Ladder style towel warmer. Directly to the rear of the property is an enclosed concreted area with pretty Manx stone walls and a pleasant stream running alongside. The oil storage tank is tucked away discreetly to the side of the property. A path and steps lead to a timber side gate. There is a raised well stocked flower bed. Water point. 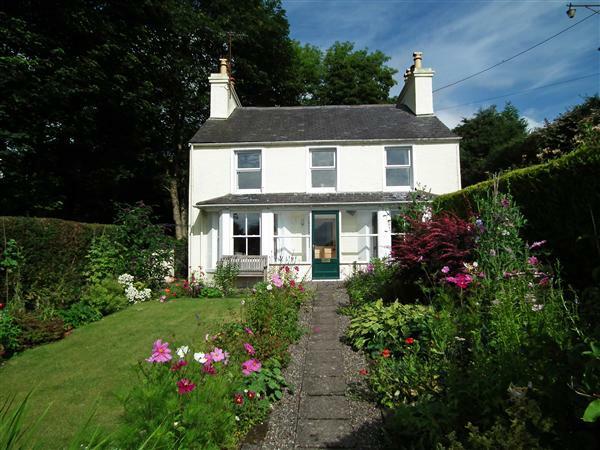 Directly to the front is a well tended country cottage style garden with an abundance of mature shrubs and flowers. A gravelled parking area for 3 cars plus a concrete drive leading to the garage, with vegetable patches to either side. Greenhouse and timber store both with power installed. Having an up and over door. Double glazed uPVC side window. Light and power are installed. Mains, Water , Electricity and Drainage. Oil fired central heating.